On November 10, winners of La Nación Foundation’s 3rd “Good Cause” contest received their awards at La Nación newspaper auditorium. 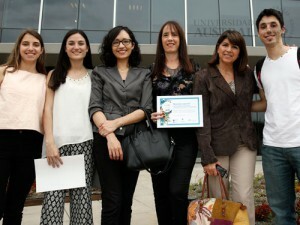 Universidad Austral’s Institute for Family Sciences, with its CERI (Center for the Study of Interpersonal Relationships), participated in the contest and received one of four special mentions awarded. The topic of choice was the inclusion of senior citizens in family life to enjoy their life experiences. The campaign’s motto is: “Some experiences cannot be googled –watch them”. Three students from Universidad Austral’s School of Communications worked with CERI’s team in this project. This initiative invites youths to learn more about the experiences, the advice and insights of older people. However, it is also an invitation to seniors to recognize and value their experiences, to share them and to be willing to incorporate new ones. As a result of this award, the campaign will be featured in several La Nación newspaper issues and its other communication tools. 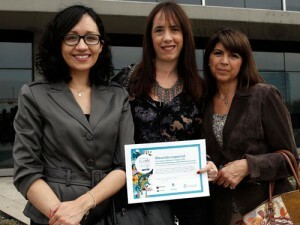 Pilar Ordóñez y Diana Díaz Alferez, from the Institute for Family Sciences, received the award on CERI’s behalf and thanked La Nación Foundation for promoting good causes with this contest. They also explained the challenge of further strengthening and valuing cross-generational ties in families. The three students from the School of Communications Cecilia Palmieri, Manuel Castelo, and Felicitas Lozada shared the honors with them on stage. Soon, CERI’s website will post specific ideas to discover these experiences that cannot be googled. We hope this campaign helps us all to embrace the notion described by Professor Dolores Dimier: “old age is not the dusk of life, but its true celebration”.